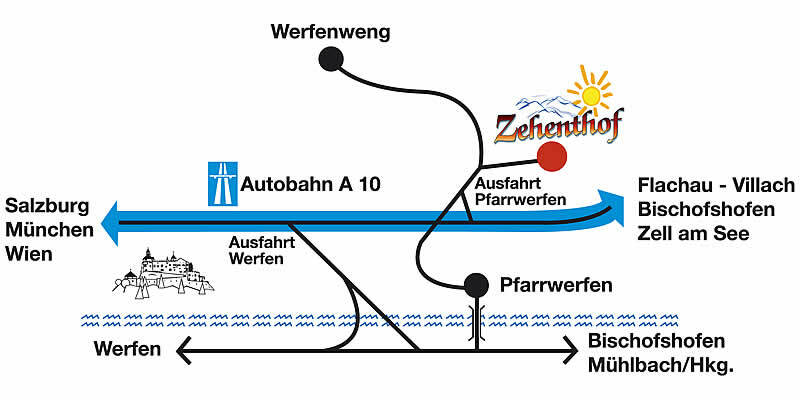 The journey to Gasthof Hotel Zehenthof in Pfarrwerfen - Werfen is quite simple. The journey to Pfarrwerfen and Werfen in the Salzburg region, is quite easy. Here you will find the exact details for a safe and simple journey. Tauernautobahn - direction Villach until you reach the exit Werfen (Exit43). Finally travel through Werfen and follow the road direction Pfarrwerfen. Tauernautobahn - direction towards Salzburg - until you reach exit Pfarrwerfen/Werfen (Exit44). We offer more than enough free parking directly in front of the hotel. If you are travelling by train, naturally we offer a shuttle service from the train station to the hotel and return. Salzburg aiport is a popular destination for many airlines. Tuifly offers a large variety of reasonable flights connecting from German cities to Salzburg. Hire a motor vehicle and travel by car to our hotel, or alternatively use the train services. We also recommend using a shuttle bus service from Salzburg with a reputable taxi company. We will glady help with the organisation.